-Prices range from $55-$405 per person, and vary depending on route which you will pick once at the airport. When you and your family visit Florida, there are an abundance of outdoor activities to choose from. Florida offers swimming, hiking and sailing. Not to mention golf and some of the best amusement parks in the country, maybe even a Segway Tour. These are all fun things to do with your family when you visit Florida, but what about something really exciting? Like helicopter rides? 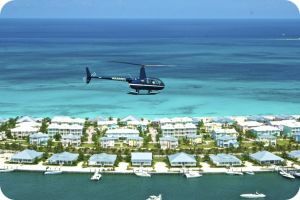 Helicopter tours in South Florida are one the most exciting vacation activities there is. There are helicopter tours of Fort Lauderdale and Hollywood Beach. Actually, there are 21 private tours to choose from. Helicopter rides are a fantastic way to see unique views of ocean wildlife and the fascinating Florida landscape. Also, who wouldn’t want to see what the amusement parks look like from above? When booking a vacation we all look for fun things to do, why not try something a little more adventurous. It’s not every day “Helicopter tours in South Florida” is going to be on the “What should we do on our vacation” list of possible activities. An added bonus to all the sightseeing is the excitement of just getting to ride in a helicopter. That experience itself will be all your kids talk about for the rest of the trip. 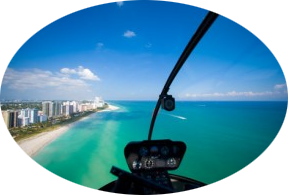 It may be hard to top on subsequent vacations but, do yourself a favor and book a South Florida Helicopter Tour! Interested in booking a helicopter tour? Call 954-903-7049 Now To Book Your Tour! The holidays are here! 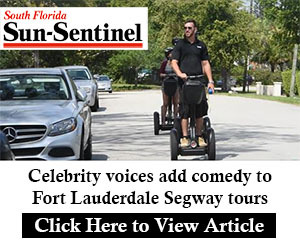 Buy a Segway tour for a friend or loved one. They make a great gift for people of all ages and anyone can do it! It takes just minutes to learn and you can purchase a one or two hour tour. Click below to purchase the #1 holiday adventure!